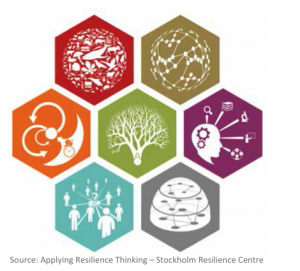 In March, I posted a blog about three of seven resilience principles put forth by the Stockholm Resilience Centre and adapted to my research. Those principles were “maintain diversity and redundancy,” “manage connectivity,” and “manage slow variables and feedbacks.” In this post, I will describe the remaining four principles and how I adapted them to economic vulnerability to hazards. Economic resilience to hazards is the ability of the local business community to handle natural hazards. By focusing on how resilience principles can be applied to that specific circumstance, we can identify targeted ways to increase resilience and therefore reduce the vulnerability of the business community. This post will look at the final four resilience principles, and how they apply to the more narrow focus of economic resilience to hazards. The fourth principle is “foster complex adaptive systems thinking.” Many of the resilience principles are based on a systems perspective, a way of thinking that emphasizes relationships and unpredictability rather than individual elements that function as they have in the past. This principle highlights the importance of not just addressing issues through individual strategies based on systems thinking, but habitually making connections between challenges. From an economic resilience to hazards perspective, this focuses on explicitly considering the connections between different disciplines, types of infrastructure, and hierarchical levels. Finding ways to create solutions that address multiple problems takes creativity and collaboration that systems thinking supports. The fifth principle is “encourage learning.” Gathering information from many sources helps both to provide more data for planning, and includes additional perspectives. This principle also encourages regular revisiting of strategies based on new information. It is easy to rely on traditional methods without evaluating them to see if they still serve. From an economic resilience to hazards perspective, this principle becomes “gather and share information about hazards resilience.” This focuses on information about how local businesses can better prepare to absorb and recover from disruptions. The sixth principle is “broaden participation.” For the sake of efficiency or ease, those with the authority to make decisions often only include participation from experts, the majority, or those proactive enough to seek out opportunities. Our communities include many members who lack the time, resources, or context to participate through traditional outreach. These community members require more effort to engage with, but their participation provides more complete understanding of the issue and strengthens social fabric. From an economic resilience to hazards perspective, this becomes “engage under-represented populations.” These populations could be based on geographic or demographic characteristics. Reaching out to voices that have not been included before leads to more representative decisions and a stronger community. The seventh and final principle is “promote polycentric governance systems.” This refers to governmental structures that can act independently and in a coordinated fashion so that key decisions can be made flexibly depending on the circumstances. From an economic resilience to hazards perspective, this becomes “share and clarify roles and responsibilities with partner organizations.” Beyond city, county, state and federal government agencies, there are many organizations that have an active role in economic development. By connecting these autonomous groups, they can plan better for collaborative efforts, avoid duplicated effort, and anticipate roles during an emergency. These four principles focus on how organizations work towards their missions on a daily basis, as opposed to the first three principles, which focused more on specific hoped for outcomes. While all are important, complex adaptive systems thinking is absolutely foundational, and sets the others up for success beyond a single project. Back in December, I posted a blog about how I think about and apply resilience to my research on hazards and the business community. From the high-level questions of “resilience of what” and “resilience to what,” this post will drill down into specific principles of resilience, and how they are applied to this topic. The Stockholm Resilience Centre has developed seven resilience principles, which form the basis of my evaluation of economic resilience to hazards. Economic resilience to hazards is the ability of the local business community to handle natural hazards. By focusing in on how resilience principles can be applied to that specific intersection of stress and system, we can identify targeted ways to increase resilience and therefore reduce the vulnerability of the business community. This post will look at the first three resilience principles, and how they apply to the more narrow focus of economic resilience to hazards. The first principle is “maintain diversity and redundancy.” Diversity helps because not all things are impacted in the same way by the same disruption when they have different qualities. Redundancy helps because functions are covered by multiple elements. If one system fails, the function is not completely lost; there are backups. From an economic resilience to hazards perspective, this becomes “support multiple types of businesses and back-up resources.” A community with different industries, locations and sizes of businesses can withstand hazards better. A community with multiple sources of power, water, and transportation options can get back on its feet sooner. The second principle is “manage connectivity.” Connectivity is tricky, because you want enough connectivity for mutual support, but not such tight connections that breakdowns spill over. For economic resilience to hazards, this principle became “strengthen supportive networks.” By thinking about the networks that provide resources and support to businesses, we can focus on the connections that will serve businesses around hazards. The third principle is “manage slow variables and feedbacks.” When systems change slowly, it can be hard to notice it happening, and even harder to determine the point at which the change is irreversible. Declining populations of fish or the pollution levels in a river are examples of this type of change. Another challenge is that there are infinite systems in our communities, and we cannot track all of them. This principle, when applied to economic resilience to hazards, became “identify and track areas of vulnerability.” By focusing on areas of vulnerability, the particular systems that businesses rely on, we are more likely to catch shifts that will have significant impact. These three principles focus on the outcomes that resilience planning seeks to accomplish. The principles in my next post will focus on the process of pursuing those outcomes. Both are important in creating resilience. Allow me to introduce myself. My name is Sarah Allison, and I am the 2014-2015 Oregon Sea Grant Resilience and Adaptation Fellow. My research looks at economic resilience to natural hazards on the Oregon coast. As an introduction to this topic, I will use this post to clarify what I mean by economic resilience within the context of natural hazards. With growing uncertainty around climate, the economy and global politics increasingly impacting our lives, resilience has become a “buzzword” in recent years. It is not always clear what it really means, though. By explaining how I am using the concept, I hope both to make it easier to understand and show that there are ways to increase our resilience, leading to safer communities. Resilience is a tricky concept, because it means different things when you apply it to different systems. You might call this “resilience of what”, like the resilience of an individual versus a building. Resilience also means different things when you apply it to different stresses. You might think of this as “resilience to what”, like the resilience to disease versus emotional trauma. At a very broad level, resilience is the ability of a system to anticipate, absorb, recover from, and adapt to a given stress. You might also think of this as reducing vulnerability to a particular threat. Because my project focuses on economic resilience to natural hazards, I will start by clarifying the “resilience to what” – resilience to hazards. Hazards resilience explores how different systems can better handle natural hazards, such as floods, earthquakes, landslides, or drought. Hazards impact many aspects of a community, including the local economy. Businesses can be destroyed in a disaster, taking vital services and employment with them, but there is a lot that can be done to help them weather the storm. This, then, becomes the “resilience of what” – resilience of the local economy. With both resilience of what and resilience to what defined, you can begin to pinpoint areas of vulnerability and ways to address them. 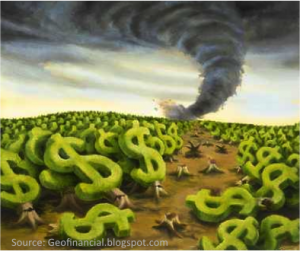 Efforts to make the business community less vulnerable to natural hazards would be considered ways to increase economic resilience to natural hazards. By looking at how communities currently support businesses in the face of hazards, we can better identify opportunities to make them safer and more secure. One way to think about the types of support the business community might need is around key principles of resilience, such as redundancy. Redundancy is a principle that affirms the value of having multiple elements serving the same function, so that if one element fails, the function is not lost. For example, if there is only one source of electricity for a community, and a disaster breaks it, then the community is in serious trouble. If it has two or three sources of electricity, then even if one of them breaks, the community as a whole has access to some electricity. A community with multiple sources of electricity is more resilient than a community with only one. Redundancy is one of seven resilience principles developed by the Stockholm Resilience Centre. These principles form the basis of my research. Upcoming posts will explore these principles, and how they have been refined for this specific project. In summary, economic resilience to hazards is the ability of the local business community to handle natural hazards. By focusing in on how resilience principles can be applied to that specific intersection of stress and system, we can identify targeted ways to increase resilience and therefore reduce the vulnerability of the business community.